With a 2560×1440 resolution this Reolink camera is significantly higher than 1080p but is it any good? I’ve been slowly building my own DIY home CCTV security system after buying a couple of cheap IP cameras. I wanted something with a higher resolution and Reolink seem to be pioneering 1440p cameras in the sub £100 price bracket. Reolink have two styles of IP camera: bullet and dome. Plus they come in two flavours of connectivity: Wireless via WiFi and hard wired Ethernet with PoE (power-over-ethernet). I bought the dome-style, Ethernet-powered, RLC-420 off Amazon UK for £64.99 (Link: http://amzn.to/2iZi8xh). Take a look at my video for some actual footage or read on for more details. Networked surveillance system. A computer on the network runs CCTV software and takes the feeds from multiple network cameras. It handles the recording, motion detection, notification etc. The Reolink RLC-420 can be set up in either of the above configurations. However, because it does not have on board storage the only option for recording is to send clips to a server using FTP. As long as you have a computer or network storage device which you can send files to with FTP it’s a doddle to set up on the Reolink. The motion detection in standalone mode is very good. I particularly like the pre-trigger buffer, that means it is continuously recording in a buffer so that when it detects motion the clip will contain a couple of seconds of footage before the motion was detected. This is good for fast moving objects like cars. You get three different ways to set up the Reolink camera. On-board configuration. Using a web browser you can access the very slick built in monitoring and configuration system. Monitoring (live video) requires Adobe Flash so it won’t work Chrome but it’s fine in Microsoft Edge or Internet Explorer. All system settings can be configured without Flash though. Android or iOS app. In addition to remote viewing, the app also give you access to all the settings. It’s a little fiddly finding your way around the app to begin with one you work it out it’s a breeze to use. Reolink desktop client software. Available on MAC and Windows the desktop software gives you access to live streams and all the camera settings. In addition it allows you to manage multiple Reolink cameras and set up scheduled recording, motion detected recording and a full playback interface. It’s actually a full network surveillance CCTV system, but only works with Reolink cameras. When I first hooked up the RLC-420 my initial impressions were WOW! So much detail when compared to the other 720p and 1080p cameras I have but that’s hardly surprising considering the resolution is almost 40% higher than 1080p. In daylight the colours are vivid and not washed out. At night the higher resolution doesn’t offer such a great advantage as the image is quite grainy. I guess this is to do with boosting brightness digitally at the cost of image quality. However it is perfectly acceptable as you can see in the following night shots. The second one show a little over exposure when the halogen floodlight comes on. Unfortunately when cars pass at night with their headlights on the brightness pretty much obliterates the detail of vehicle as can be seen in the third image. I guess for under £100 you can’t expect perfect night vision. When combined with a separate and more powerful IR floodlight illuminator (which I’m hoping to order soon) I expect the night vision performance will be greatly improved. Watch this space! There are lots of network surveillance systems out there. Some are free while others are way too expensive for a small home security setup. I chose Blue Iris as it is one of the more popular ones and it’s not very expensive – approx. £50 for a multi-camera licence. It’s been around for a long time and has a healthy community of followers. Reolink provide a guide on setting up their cameras with Blue Iris here but it is pretty straightforward if you are already familiar with using Blue Iris. When using CCTV surveillance software it’s a good idea to set the FPS (frames per second) for storing video to 10 or less. If you leave it at the default 25 FPS the video files are going to be huge especially at 2560×1440 resolution! 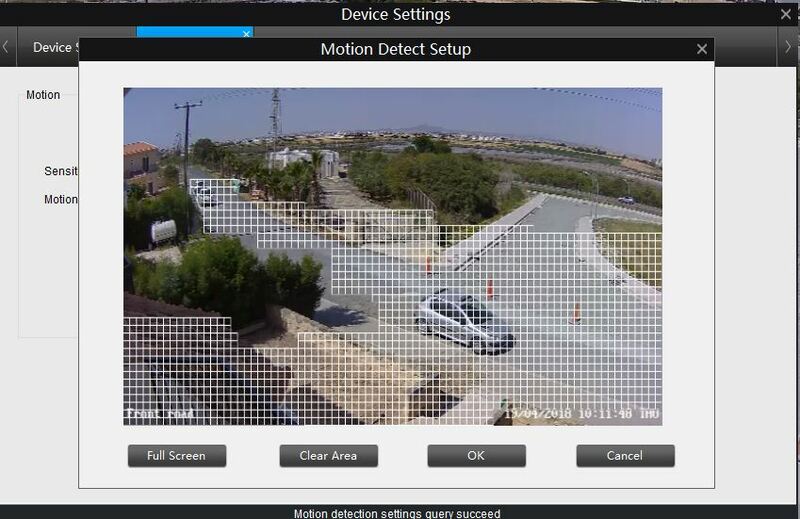 You should do this in both the camera’s settings and the CCTV software that way the camera is not using unnecessary bandwidth on your network and the PC running the CCTV software doesn’t get overwhelmed! The main router in my home is connected to a Powerline adapter so the Reolink camera is accessible on my network connected to this Powerline adapter. Using the PoE adapter I only have to run an Ethernet cable to the camera. The PoE adapter only cost £6.55 (Amazon link: http://amzn.to/2zijh9h ) and it’s been working perfectly with the Reolink camera since I installed it. Another power option is not to use PoE at all. You can use the supplied power supply to connect to the power connector on the camera – you can see this connector in the video. If you’ve got any questions about the Reolink camera or using it with Blue Iris feel free to ask below. RE: Another power option is not to use PoE at all. You can use the supplied power supply to connect to the power connector on the camera – you can see this connector in the video. My RLC-420 didn’t come with a power adapter. What voltage and current is required? I see it’s marked POSITIVE tip and NEGATIVE ring. Hi Mark. A very interesting review. As a user of this camera I can confirm that my experience has been mostly positive. I am struggling a lot with the motion detection. I simply cannot get the camera to ignore movement outside the detection zone that I have set up on by front door. For example I am constantly getting false triggers as a result of reflections in the glass next to my door or movement of my neighbours car on the drive way. Do you have any experience of the movement detection which may assist me in getting rid of the false triggering? Hi, great review and very useful to see your junction box setup in the video. I’m struggling to find a suitable gland/seal for the cable hole on the junction box. Did you buy the black rubber circles separately to the junction box? Have been searching Amazon but not managed to find one suitable. Hi Ben, glad you liked the review. I bought the box and the grommets from an over-the-counter electrical outlet here in Cyprus – a sort of trade center which is also open to the public. The box did not have the holes or have push outs for the holes so I just used a 20mm hole drilling bit which is actually designed for wood bu cuts the plastic quite easily. The main thing with the grommets is they have to be big enough so the hole they go in is big enough for the ethernet connector on the end of the camera cable to fit through but have no pre-cut hole in them so you can make your own hole in the middle with a cut to the edge if you see what I mean. Many thanks Mark. I didn’t know the black disks were called grommets, with that knowledge I was able to buy some over the weekend and get the junction box and camera installed. Drilling a hole in the grommet then cutting from the hole to the edge was a good method too, thanks. Wish these cameras just had 1 slim PoE cable! Other than that they’re great though. Hi Ben, what junction box did you go for, and was it IP66 rated? Found one at Toolstation but I think it will be very small. I bought mine from a local hardware shop here in Cyprus. It was IP68 I think. Doesn’t need to be that big. I’ve used 80cm diameter round ones for other cameras. EDIT: Just realised you were asking ben! I’ll leave this here anyways!